In 1899 an additional Smelter called the West Smelter, which commenced operation in December of that year, was erected near No. 2 Mine, near the Crow’s Nest settlement. The West Smelter was destroyed by fire, on June 14, 1902. Construction of the present smelting plant began in April of 1903 and the first tap was made on July 17, 1904. View of the West Smelter. From the 1901 Census of McKim, town of Copper Cliff, “Italy” there were about eighty people of Italian descent, primarily lodgers in boarding houses. Most were men, born in Italy and mine labourers. Heads of households included Frank Marcus, born in Italy in 1855, immigrated in 1890 with his wife Mary, with twenty lodgers; James Ross, with seven lodgers; Nicolo Mastremaneo with twenty lodgers and Peter Antone with thirty-three lodgers. 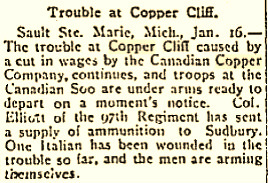 In 1904 Italians working at the Canadian Copper Company smelter in Copper Cliff quit work because they had been put at contract work instead of regular wages. They started in to stop others from working and succeeded with quite a large number. They fired several shots at Constable Storie and some special constables, but ten of the ringleaders were rounded up and landed in Sudbury jail. At the preliminary investigation before Police Magistrate Brodie three were discharged, and the others were tried. The Italian Consul from Montreal attended the trial of those in jail. By 1911 Italians had been drawn to the nickel mines and smelter in the Sudbury district, where 620 settled at Copper Cliff. From the Vernon's City Directory of 1911 Residents of the Crow’s Nest, also know as the West Smelter, included Giacmo Demarco; No. 182 William Boyd, Philip Stinson (born in Ireland, Smelter labourer) and Robert Warrington; No. 190 R. J. Mills; No. 191 Godfrey Mondrux, Carlo Pisolator, Domenic Girdone, Leonidre Valopena (Grocer), Tony DeStefano, Carlo Domenic (Grocer), Tony Bertuli, Andrea Belliggi, Chas Lewis, Tenoi Depetrillo, Santo Tessaro, Signoretti Armenio, John Bradley, Thomas Cook, Bartisto Beritto; No. 209 Tito Amontea. In 1914 William Boyd’s house in the Crow’s Nest caught fire and 23 volunteer firefighters answered the call. The inside of the house was gutted, but the frame remained intact. Batista Belisa, age 27, born June 1883 in Italy, immigrated in 1907, his wife Maria, age 31, born June 1880 in Italy, and lodgers Geovanni Tanibaro, married, age 35, born December 1875 in Italy, immigrated in 1907, his brother Pietro Tanibaro, married, age 41, born April 1870 in Italy and immigrated in 1907, Raffaele Peluse, age 23, born March 1878 in Italy, immigrated in 1911, Enrico Peluse, married, age 28, born April 1883 in Italy, immigrated in 1909, Antonio Tamburo, age 24, born June 1886 in Italy, immigrated in 1910, Vincenzo Peluse, married, age 30, born November 1880 in Italy, immigrated in 1911, Guiseppe Gugliarda, married, ate 27, born January 1884 in Italy, immigrated in 1908, Raffaele Magnone, married, age 38, born November 1872 in Italy, immigrated in 1908 and Antonio Deurom, married, age 29, born May 1882 in Italy, immigrated in 1910. The next household was Thomas Cook, age 48, born June 1862 in England and immigrated in 1889, his wife Mary Ann, age 50, born July 1861 in England, daughter Branico, age 19, born April 1892 in Ontario and son William, age 15, born March 1876 in Ontario. John Bradley, age 40, born January 1871 in Ontario was a carpenter for house building, Irish origin, his wife Mary, age 41, born March 1879, a nurse, their daughters Eliza, age 8, born December 1902, and Annie, age 5, born May 1906 and son John, age 3, born April 1908 in Ontario. Guerino Batarini, age 24, born June 1886 in Italy, immigrated in 1907, his wife Irene, age 23, born August 1887, immigrated in 1911, and lodgers Geacomo Balsamini, age 52, born August 1858 in Italy, immigrated in 1910, Aristo Giardini, age 19, born May 1892 in Italy, immigrated in 1910, Ermeto Trebi, age 18, born February 1892 in Italy, immigrated in 1911, Fonuaoti Sanchioni, age 18, born December 1892 in Italy, immigrated in 1911, Baselio Giardini, age 28, born January 1873 in Italy, immigrated in 1911 and Enrico Rosati, age 23, born April 1888 in Italy, immigrated in 1909. Sandi Tessadro, age 34, born May 1877 in Italy, immigrated in 1906, his wife Oliva, age 33, born April 1878 in Italy, immigrated in 1908 and Emelio Tessadro, Sandi’s brother, age 23, born April 1888 in Italy, immigrated in 1910. Antonio DePetrilla, age 29, born April 1882 in Italy, immigrated in 1899, painter, his wife Guiseppina, age 20, born February 1891 in Italy, immigrated in 1904, their sons Pasquali, age 2, born November 1909 in Ontario, Adolph, age 8 months, born in Ontario September 1910, Antonio’s brothers Carmino, married, age 37, born May 1874, born Italy, immigrated in 1889 and Giovanni, age 16, born September 1894 in Italy, immigrated in 1911. Lodgers were Carmina Stranino, age 21, born February 1890 in Italy, immigrated in 1907, Rinaldo Sasso, age 21, born January 1890 in Italy, immigrated in 1908, Edwardo Stramino, age 18, born April 1893 in Italy, immigrated in 1911, Vincenzo Sasso, married, age 23, born April 1888 in Italy, immigrated in 1910, Bernandiro Forco, age 23, born June 1887 in Italy, immigrated in 1910 and Pietro Dalarico, age 28, born February 1883 in Italy and immigrated in 1900. Charles Lewis, age 40, born February 1871 in England, immigrated in 1905, worked in the Smelter, his wife Eliza Jane (Bynes), age 35, born March 1876 in England, their daughters Florence Eutaie, age 16, born January 1895 in England, Elsie May, age 15, born June 1895 in England, son Charles Edwin, age 12, born December 1898 in England, daughter Eva Emily, age 11, born January 1900 in England, son Leonard Edna, age 9, born February 1902 in England, and daughter Grace Lena, age 7, born June 1903 in England, died at age 13 due to drowning in Kelly Lake. Son Thomas William, age 3, born March 1908 in Ontario and daughter Hida Ida Victoria, age 1, born December 1909 in Ontario. Andrea Beletsi, age 26, born April 1885 in Italy, immigrated in 1900, his wife Catarina, age 19, born August 1892 in Italy, immigrated in 1909, son Domenico, age 2, born April 1910 in Ontario and lodgers Enrico Marclavrci, married, age 22, born February 1889 in Italy, immigrated in 1909, Batista Ovassio, married, age 55, born April 1856 in Italy, immigrated 1909, Necola Mauleanci, age 18, born June 1892 in Italy, immigrated in 1910, Marco Ieci, married, age 55, born October 1855 in Italy, immigrated in 1907. Antonio DeStefano, age 29, born August 1881 in Italy, immigrated in 1904, his wife Maria, age 29, born August 1881 in Italy, and their children Geovanni, age 9, born June 1902 in Italy, Maria, age 6, born January 1905 in Quebec, Angelo, age 4, born January 1909 in Ontario, Francesco, 6 months, born November 1909 in Ontario, Antonio’s brother Ballio, age 24, born June 1886 in Italy, immigrated in 1909, and lodgers Nicola Tamburi, married, age 35, born January 1875 in Italy, immigrated in 1907, carpenter, Marci Tamburi, married, age 25, born October 1885 in Italy, immigrated in 1907, Pasquale MacArini, age 26, born June 1884 in Italy, immigrated in 1901, Billppo Ferrara, widowed, age 50, born May 1861 in Italy, immigrated in 1904, Francesco Moletonio, age 52, born May 1859 in Italy, immigrated in 1907, Antonio Petroni, age 28 born June 1882 in Italy, immigrated in 1903, and Achille Antreci, married, age 37, born February 1874 in Italy, immigrated in 1907. Guiseppe Bondi, age 28, born November 1882 in Italy, immigrated in 1909, his wife Mria, age 22, born November 1888 in Italy, their daughter Ida, age 1, born February 1910 in Ontario, son Geno, age 3 months, born February 1911 in Ontario and lodgers Ariao Luigi Arel, married, age 56, born August 1854 in Italy, immigrated in 1906, and Beulto Bernacico, age 18, born November 1892 in Italy, immigrated in 1909. Leonida Volpini, age 27, born October 1883 in Sans, Italy, immigrated in 1905, his wife Esterino (Geovanni), age 23, born November 1887 in Sans, Italy, immigrated in 1908 and daughter Ada, age 10 months, born August 1910 in Ontario. Leonida and Esterino were married October 2, 1907 in Nipissing District. Lodgers were Ermenia Cardarelli, age 18, born Mary 1893 in Italy, immigrated in 1911, and Angelo Arguinoni, age 16, born February 1875 in Italy, immigrated in 1911. Catore Secco, age 25, born January 1886 in Italy, immigrated in 1910, bricklayer for houses, his wife Serafina, age 23, born April 1888 in Italy, and lodgers Geovanni Damarchi, married, age 28, born January 1883 in Italy, immigrated in 1911, Relezi Petrilli, age 33, born July 1877 in Italy, immigrated in 1907, Olivo Bello, age 26, born July 1884 in Italy, immigrated in 1907, Vencenzo Galinaro, married, age 32, born August 1878 in Italy, immigrated in 1911, and Fileppo Antonaesi, age 17, born December 1893 in Italy, immigrated in 1911. Asunta Adonti, widowed, age 33, born August 1877 in Italy, immigrated in 1905, her sons Guiseppe, age 4, born September 1906 in Ontario, and Deolio, age 2, born December 1908 in Ontario and lodger Marteo Giambatiste, age 34, born October 1876 in Italy, immigrated in 1907. Domenico Ciardullo, age 23, born July 1887 in Italy, immigrated in 1908, merchant in general store. Umberto Bruttocao, age 32, born October 1879 in Italy, immigrated in 1909, his wife Maria, age 29, born March 1882 in Italy, immigrated in 1910, their sons Antonio, age 2, born April 1909 in Italy, Angelo, newborn April 1911 in Ontario, Umberto’s brother Mose, married, age 34, born July 1876 in Italy, immigrated in 1907, and lodgers Angelo Sartoretto, married, age 36, born June 1874 in Italy, immigrated in 1911, Mechele Favaroa, married, age 29, born Muly 1881 in Italy, immigrated in 1911, Antonio Monaco, age 20, born July 1890 in Italy, immigrated in 1911, Lounzo Martina, age 18, born January 1893 in Italy, immigrated in 1910, Cullan Morolatto, age 27, born May 1884 in Italy, immigrated in 1910, Masinio Cavalier, age 23, born August 1887 in Italy, immigrated in 1906, Abramo Pietroboa, age 23, born August 1887 in Italy, immigrated in 1901. Luigi Cecconi, age 25, born January 1886 in Italy, immigrated in 1905, and lodgers Attelio Rossi, age 28, born June 1882 in Italy, immigrated in 1904, Nazereno Reni, age 23, born July 1887 in Italy, immigrated in 1906, and Guiseppe Cecchini, married, age 28, born June 1882 in Italy, immigrated in 1906. Luigi Russoto, age 40, born June 1870 in Italy, immigrated in 1911, his wife Regina, age 33, born September 1877 in Italy, daughter Maria, age 6, born March 1905 in Italy, Angela Freeland, married, age 26, born May 1875 in Italy, immigrated in 1909, lodgers Glenno Octriao, age 18, born December 1892 in Italy, immigrated in 1909, Reetro Baging, age 21, born October 1880 in Italy, immigrated in 1903, Guiseppe Cadavieco, age 27, born May 1884 in Italy, immigrated in 1911, Giavanni Trinca, age 29, born June 1881 in Italy, immigrated in 1911. Giacomo Demarco, married, age 38, born November 1872 in Italy, immigrated in 1904, his wife Orsola, age 40, born March 1871 in Italy, immigrated in 1907, their children Oezelia, age 9, born December 1901 in Italy, Augelo, age 7, born December 1903 in Italy, Ramedio, age 1 born March 1910 in Ontario, and Polio, 1 month, born May 1911 in Ontario, lodgers Lorenzo Presasco, age 27, born May 1884 in Italy, immigrated in 1905, and Guiseppe Presasco, age 16, born June 1895 in Italy, immigrated in 1911. Robert Ederington, age 38, born July 1872 in Ontario, Irish origin, labourer in Boiler Shop, his wife Losanai, age 36, born April 1875 in Ontario, Irish origin, daughters Katrice, age 17, born June 1893 in Ontario, domestic, Eddilearl, age 16, born January 1895 in Ontario, domestic, Sarah Florence, age 12, born September 1898 in Ontario, Iny Gladys, age 5, born June 1906 in Ontario. Henry Donald John Bruce, age 30, born September 1880 in Scotland, immigrated in 1882, electrician, his wife Emily Louise, age 30, born September 1880 in England, immigrated in 1886, sons Douglas M. Lonala, age 2, born April 1909 in Ontario and Gordon McDonald, age 3 months, born February 1911, Ontario. From the 1911 Census of Copper Cliff – Place of Habitation “Italy”, Domenico Uguccioni, married, age 29, born February 1882 in Italy, immigration in 1900, occupation baker, his wife Adde, age 26, and Domenico’s brother Giovanni, age 34. In 1914 Cesare Paci, living at 15 Domenico Street had a bakery, ice cream parlour, a trucking business and a taxi service, as well as a mail delivery service. Cesare was born in 1888 in Rosciano, Pesaro, Italy. He immigrated in 1904. His wife was Anna Roscini of Lucrezia, Italy. Daughters included Gertrude, Amelia, Amelina, Deborah, and Novemia; twins (boy and girl), a son and two daughters died as infants. Cesare Paci went into the investing business, buying and renting property, mainly in Sudbury. He built a home on 5 Pietro Street. He bought an old McLaughlin car and did some taxi business for the townspeople and was employed as an agent for the Sudbury Brewing and Malting Company. In 1916 the bakery was run by Emelio Augostinelli. By 1930 Jas Toppazzini owned the bakery business at 15 Domenico Street. In 1911 barbers included Harry Pillippi, Italy; Bruno Travaglini at 5 Domenico Street, by 1914 Resandro Taus at 16 Domenico Street and in 1930 Angelo Cundari at 6 Craig Street and George Lougheed at 1b Diorite Street. R. H. ‘Harry’ Sargeant started at 94 Diorite Street in 1911 and moved his shop to 1 Diorite by 1914, to include tobacconist. Peter Pikoski, an insurance agent at 2 Diorite, was also a barber in 1914. 1914 Edward Wartsz ran a billiard hall at 4 Domenico Street in 1914, subsequently owned by P. Garibaldi in 1916. Official boarding houses were managed by John Keon at 10 Diorite Street (1914 – 1916); Mary Ovens at 3 Diorite Street (1914 – 1916) and L. Piccini at 11 Venice Street in 1916. However, boarders or lodgers were common in most homes. Giuseppe Cassio immigrated in 1900 from Italy. From the 1911 Census of “Italy” in Copper Cliff, Giuseppe Cassio, age 35, born February 1876 in Italy, his wife Eva (Watier), age 20, Married April 13, 1910 in Copper Cliff, and their son Romano, age 8 months. A second son Louis was born March 21, 1914 in Copper Cliff. Giuseppe’s occupation was butcher. From 1911 to 1916 Achille Bargnesi was a butcher at 14 Domenico Street. His brother Celeste had a Meat Market at 3 Domenico Street. In 1930 Aldolfo Pianosi purchased the Bargnesi Brothers’ Meat Market where he had worked for six years, renamed the Pianosi Meat Market Ltd. Aldopho Pianosi was a founding member of the Italian Club and one of the original members of St. Stanislaus Church. Adolfo was born in Fano, Italy in 1889 and immigrated to Canada in 1907. He married Anna Nori and returned to Copper Cliff in 1914. His son Adiuto (Red) Pianosi and 9 other Italians formed an investment club with real estate holdings in Sudbury. Mr. Pianosi's service in World War II was with the Royal Canadian Air Force. On return to civilian life, he resumed involvement with the family butcher/grocery business. The post-war prosperity contributed to the expansion of Pianosi business ventures, while Red was becoming more active in the affairs of the Progressive Conservative Party. Many organizations sought ‘Red’ Pianosi's counsel and support, which was predictably forthcoming. His alma mater, St. Michael's College, designated him Alumnus of the Year. The honour that epitomizes Red Pianosi's life and generous spirit was his investiture in the Order of Canada, in the presence of Governor-General, Jeanne Sauve, at Rideau Hall, Ottawa, 30 October 1985. The following citation was read: "This Copper Cliff businessman has given of his time, expertise and personal funds to virtually every artistic, educational, charitable or sporting event that has taken place in the Sudbury area over the past fifty years. In addition he has been a member of the boards of hospitals, the Sudbury Theatre Centre, the University of Sudbury, Laurentian University and other institutions." Other butchers were H. D. Barlow east Diorite, Foreli Fredarico “Italy” in 1911, G. Monaldi at 11 Genoa Street in 1916, W. J. Wilson, 5 Diorite (1914 – 1916) and J. Falcioni, 36 Diorite. Luigi Frattini of 3 Venice Street owned a cartage business and by 1930 was an Ice Dealer, Cartage, Local and Long Distance and supplied wood. In 1930 Nazzareno Volpini had a confectioners shop at 8 Domenico Street. In 1930, Mrs. Stella Vitelli had an ice cream parlor at 5 Domenico Street. For the period 1914 – 1916, Newton Morrison of 22 Diorite Street was a drayman. Giuseppe Fabbro was a merchant in a gentleman’s store. From the 1911 Census of “Italy”, Guiseppe Fabbro, age 29, born December 1881 in Italy, immigrated in 1898, his wife Otta (Ida Peres), age 27, immigrated in 1904 (married March 16, 1904 in Fagana, Italy and their children Lemi, age 4, Luigi, age 3, Demochle, age 2, born at Creighton Mine, Nelli, age 3 months and lodgers Jiulio Aressllo, age 50 and Antonio Diulio, age 31. Son Joseph J. (Joe) Fabbro (June 14, 1914 - January 16, 1978) was a Canadian politician, who served as mayor of Sudbury, from 1957 to 1959, 1964 to 1965 and 1968 to 1975, and as chair of the Regional Municipality of Sudbury from 1975 to 1977. Grocers included Carlo Domenic, Leonidre Valopena, both at the Crow’s Nest in 1911; Frank Ciarduelo, 25 Craig Street in 1916, and Nicholas Polano at 41 Diorite Street in 1930. From 1911 - 1914 a General and Dry Goods store - Taus Nazzareno & Co. was at 10 Domenico Street. From 1914 – 1930 Taus Nazzareno & Co. included groceries, men’s clothing, work boots, hats, jewellery at the same location. 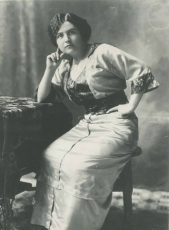 About 1902 Nazzareno Taus immigrated to Canada. He was married to Adelia. Their children were Giuseppina, Gino ‘Bozo’, Delia, born 1908, Bruno, Ada, Ezio, Irene, Duilio ‘Spenny’, and Alfio ‘Nef’. The store was managed by Mr. Nazzareno Volpini ‘Fox’. The dry goods section was operated by Mrs. Ida Volpini. Fox was able to read and write and was in charge of ordering and accounts. Nazzareno Taus owned another store, the Cooperativa, but in later years it was made into a dance hall. The dance hall was located in the Taus building on Domenico Street. The hall was later converted into an apartment. Art Gimpoli used to play there with a five or a six piece band. From the 1911 Census of “Italy” Nazareno Taus, age 33, born February 1878 in Italy, immigrated in 1903, Merchant in a general store, his wife Adilia, age 27, their children Guiseppina, age 5, Gino, age 4, Adelia, age 3, Bruno, age 1 and lodgers Mario Piaseasi, age 21, Alturo Taus, age 16, born 1895, Italy, immigrated 1910 and Romeo Taus, age 19, immigrated 1911. Romeo was born October 1891 in Italy. In 1904 Emilio Galardo of 31 Diorite Street established Galardo Photo Studio at 35 Diorite Street. The studio remained in Copper Cliff until 1921 when he and his family moved to Sudbury. Emilio Galardo was born in 1877 in Mignano, Campania, Italy. He married Rosa Di Gianatale. Emilio Galardo, was an accomplished, talented photographer and owner of Galardo Studio in Sudbury. The married father with three children was 62 years old and a citizen (a naturalized British subject) at the time of his arrest and internment. During World War II, Emilio Galardo and his son Pasquale were arrested at the family photography studio in Sudbury. Pasquale was released from jail, but Emilio was taken to Camp Petawawa where he was interned for one year. Subsequent to Emilio’s arrest, police arrived at the family home and searched through his belongings. The reason given for Emilio’s detention was his membership in an Italian club. Beatrice’s mother and brother tried to visit Emilio twice, but were turned away both times. In order to sustain the family during Emilio’s absence, Pasquale worked at the photography studio, while Emilio’s wife took in boarders. In 1911 L. Nyman was a printer at 79 Diorite Street. Shoemakers included Alex McNevin at 79 Diorite Street in 1911, and at 2 Diorite 1914 – 1916; and Chas. Benvenuto at 52 Diorite 1914 – 1916. By 1930 Emilio Valentine had a taxi service from 62 Diorite Street. Secondo Renzoni was born in 1888 in Fano, Marche, Italy. He married Emma Furlani. From the 1911 Census of “Italy” Secondo Rensoni, age 23, immigrated in 1907, occupation bricklayer for house building ‘mason’, his wife Emma, age 21, housekeeper, their daughter Elba Antonia born October 1, 1911, and died at age 21 of rheumatic carditis. Lodgers included Secondo’s brother Terso Rensoni, age 20, Generose Buddasi, age 29, Ricardo Dordoni, age 21 and his brother Alfredo Dordoni, age 18, Ludovini Negaaoti, age 18 and Basilio Delmonti, age 23. Secondo and Emma’s son Luigi 'Louis' Secondo Renzoni was born February 7, 1913. At his birth the address of his parents was 162 ½ Italy. By 1920 Secondo had a house at 9 Domenico Street and worked at International Nickel. From the July 1968 Inco Triange, “The highest honor in Canadian chemical engineering, the R. S. Jane Memorial Lecture Award has been awarded to Louis S. Renzoni, vice-president and manager of process research (Canada) of The International Nickel Company of Canada, Limited, Toronto.” In 1993 Louis was inducted into the Canadian Mining Hall of Fame. Renzoni said that his induction was "a realization of an impossible dream." He accepted the award on behalf of all of his colleagues who had aided his research efforts throughout the years. Louis Renzoni. Canadian Mining Hall of Fame. University of Toronto Faculty of Medicine professors recognized for Officer of the Order of Canada (2014) include Dr. Norman Emilio Marcon. Norman was raised in Copper Cliff and obtained his degree in Medicine in 1962 at Queen's University in Kingston. Dr. Marcon did his Internal Medicine at the University of Toronto hospitals. His GI training was at the Boston City Hospital, Harvard Unit and the St Mark's Hospital, London, England. He returned to Canada to start the Gastroenterology Division at the Wellesley Hospital in Toronto. Dr. Marcon is currently a Senior Gastroenterologist at St Michael's Hospital. Luigi Christiano Smania, Smelterman, age 36 of Copper Cliff, married Virginia Casagrande, age 24, of Copper Cliff on October 20, 1923. Both were born in Italy. Luigi immigrated in 1913, Virginia in 1923 “going to join her fiancée” and “passage paid by self”. Although Domenico Gaggi became a citizen (a naturalized British subject) in August 1937, when World War II broke out he was designated an enemy alien along with his wife Yolanda and was required to register with the local Royal Canadian Mounted Police (RCMP). This document is his Registration Certificate, signed by the Deputy Registrar Robert Morrison in Copper Cliff, Ontario on August 12, 1940. Enemy aliens were required to keep such documents on their person at all times during the war years.